Have you gone to an event and felt underwhelmed by the level of presentation? Whether it’s a church event, a wedding, or a concert, you want to put together an exciting and memorable production that will send everyone that attends home happy. The right stage effects can be a highlight of the whole event or they can accent things perfectly to bring everything together in a way that’s satisfying to everyone. If you’re planning an event, you might be wondering what cool special stage effects you could use to make it awesome. 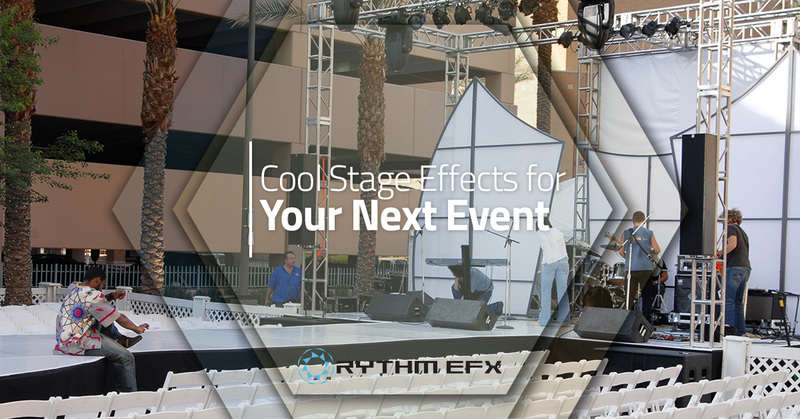 With that in mind, we wanted to detail some of the coolest stage effects you can add to your event when you work with Rythm EFX, Northern Colorado’s premier event production company. Probably the coolest effect we provide, literally. With CO2 fog, you can cool down a hot crowd and create an awesome ambiance for the crowd to hang out in. Whether you mount them on the stage or trusses, you can have the Cryo-Fog come out at the perfect moment in your event. Musicians can time it up with their songs and speakers can use it to punctuate a point. This equipment is incredibly easy to control and all it takes is a touch of a button to deploy the fog strategically. With blasts of fog that can reach up to 28 feet tall, this is a cool way to make an impact. You can either rent this equipment and run it on your own or we can design the perfect program of effects to make your event pop. What’s a party without confetti and streamers? If you ask us, it’s a party that isn’t as great as it could be. We use the latest in confetti and streamer technology to produce some of the most interesting effects around. Whether you want classic and colorful confetti or you want to mimic snowfall without the chilly temperatures, we can give you something unique and exciting for your party. The confetti and streamer blasters can be mounted on the floor or hung from the trusses to make it fit anything from a private party to a huge stadium show. No matter what type of effect you’re looking for, our team of experienced production professionals will help you create exactly what you’re looking for. These continuous flow confetti machines can create many different effects, so ask our experts what they would recommend for your event. For many years, pyrotechnics was reserved for large venues due to fire hazards. Thankfully that changed with the development of Sparkular cold pyrotechnics. Rythm EFX is one of the few companies that have been selected to offer this incredible cold fountain firework display system. Normal, production-grade pyro can run hotter than 1,200 degrees Fahrenheit, is incredibly difficult to control, and is often banned by both local and regional ordinances. Because the Sparkular system is non-flammable, it is far safer and doesn’t have the awful smell of traditional pyro displays. That means you can add a safe fireworks display to your event without the worry of putting your audience in danger. Since it is non-flammable, that means you can combine pyro with confetti and streamers to spectacular results. You would be amazed at how much the right lighting can bring an event together. Set the tone with a classy and customized LED display or go big and boisterous with strobe lights. You can also add water or fire effect lights to give your event a whole new level of depth and dimension. Combine the gold beacon lights with any of the other lighting displays we offer to make a fun and exciting reveal or celebration feel even bigger. We also offer two different styles of moving head lights that can be coordinated with music or operate as a beautiful wash light to set a mood. What if you want something a little crazier? How about our massive UV blacklight palettes? They work perfectly for everything from nightclubs and concerts to private parties and more. After all, who doesn’t love blacklights? If you have a big event that you want to give that professional touch to, an LED video wall gives you an easy way to display pictures and videos on a large scale. Their vibrant picture capability makes it easily visible for everyone, no matter where they’re at in the building. Even if you don’t have video you want to show, using an LED light wall is an amazingly flexible, easy to set up and run way to take your event to the next level. Because our LED systems are much less labor-intensive than video and light walls of the past, they’re much less expensive to use. That means you don’t have to break the bank to add an incredible background to your stage display. Utilize an LED video wall to communicate to your audience and accentuate your verbal points concisely. Do you have an incredible idea for your event but don’t have the ingenuity to build it? Let us build it for you! Whether it’s a custom backdrop or a theatrical stage, you can be sure we can do it. Our talented design team loves to dive into fun and exciting projects, so if you can imagine it, we can make it. Elaborate and awesome stage pieces and props are a breeze and can make your event stand out like nothing else. We can even build custom DJ booths for your next concert to really make a statement. Don’t feel restricted to what goes on stage; we can build custom sets for any type of event you’re looking to put on. No matter if you’re putting on a play or you want a beautiful set piece to illustrate a point you’re making in a speech, our designers will give you a memorable piece your audience will be talking about. When it comes to concerts, church events, performance art, weddings, and everything in between, we’ve got the cool stage effects to make your event break away from the norm. Our design team will be excited to help you customize and design all of the effects you choose to create something memorable and unique that we’re sure you’ll love. If you would like to learn more about what Northern Colorado’s premier event production company can do for you, call Rythm EFX today. Whatever type of event you’re planning, let us make it beautiful for you. From stage design to lighting, to special effects and custom props, we’ll bring it all together for an event to remember. We hope to hear from you soon!